Legrand CRM is equally at ease managing relationships with companies as with individual contacts. Company-specific information is only stored once and is not replicated for every contact. Appointments, Activity Notes and Opportunities are linked to both account and individual contacts, helping you keep track of everyone who’s involved. Many businesses include external employees from consulting firms, IT support specialists, or other businesses. Related Contacts help you keep track of these external employees and lets you clearly see activity notes and tasks where they matter most – on the account for whom the work was for. Use our Campaigns module to create and track each of your ongoing campaigns. From traditional media, to field marketing, to e-marketing campaigns – Legrand CRM offers an intuitive platform to monitor campaign progress. 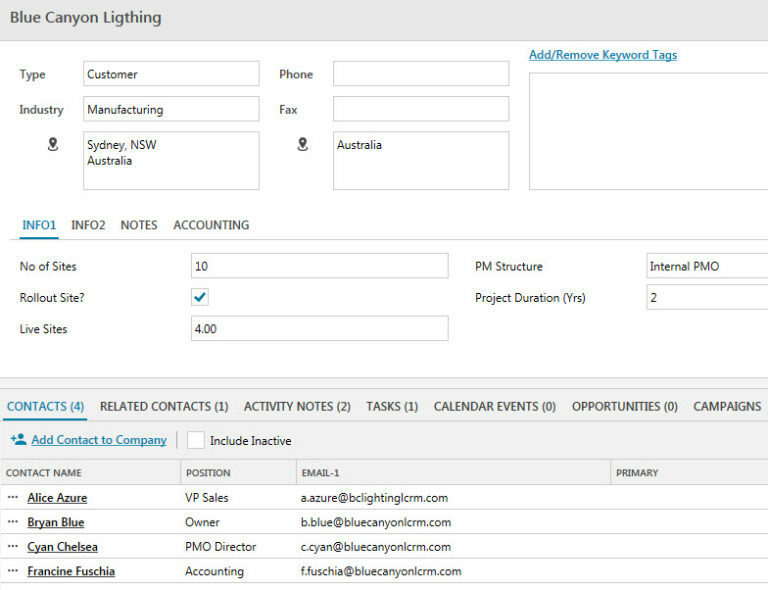 One of Legrand CRM’s key features is the ability to intuitively create and manage lists. In order to be successful with your campaigns, it’s critical that you target the right customers. We make it easy for you to segment your companies and contacts into as many lists as you need for targeted communications. Leverage different combinations of keyword tags and user fields to create precise lists for your marketing campaigns. Managing campaigns directly within your CRM means you get a more comprehensive picture of your accounts and contacts. In addition to seeing ongoing interactions between your staff and your clients, you can see how your contacts are responding to your various marketing campaigns – all from one screen. Campaigns divides your contacts into Targets and Respondents. Easily see which of your contacts you’ve been able to reach and what follow-ups are documented. Create specific and reportable actions that make sense for your business and the specific type of campaign. Easily monitor the value and volume of opportunities at each stage in your pipeline. Model your stages to fit your needs and make reporting as intuitive as possible. Using our new reporting features in Version 7 you have even more flexibility in how you review your sales pipeline. Take the guesswork out of monitoring your businesses ongoing opportunities. Tags quickly show you which opportunity has an overdue task, unscheduled items, or upcoming scheduled activity. Team members can easily reschedule overdue activities directly from the Sales Pipeline with our reschedule feature. Keep everyone on the same page with a structured process for progressing and regressing from one sales stage to the next. Just drag and drop! Increase your sales team’s efficiency by providing a fast and intuitive quotation tool that enables them to respond quickly to sales opportunities as they arise. Sales Managers have detailed visibility of all active quotes, their margins and revision history. Track customer issues, feedback or questions. You can also use it to track and manage service jobs, repairs or installations. 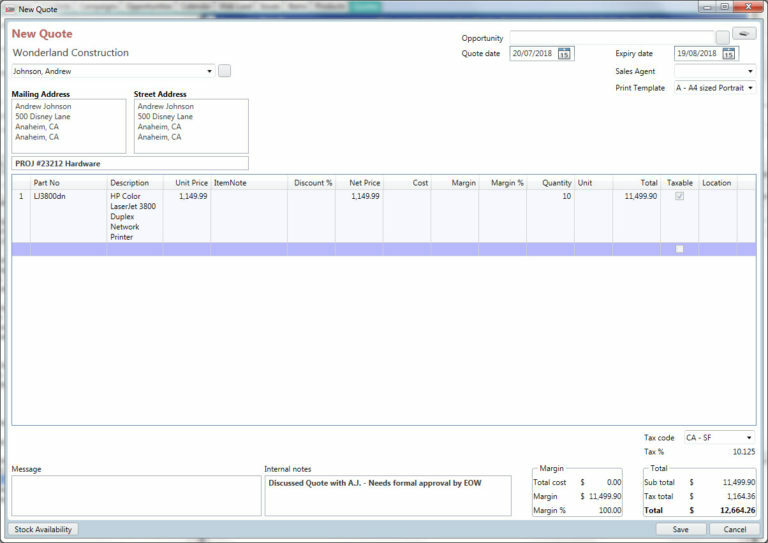 If you use the Asset/Item tracking module, you can link a service job to a specific item that the customer owns. Leverage the ability to track the service history of a specific item over the years. This module can be used to track items that a customer has bought from you. Track valuable items such as office equipment, machinery, cars, or jewelry! Any item where you may need to track a serial number, purchase date, warranty date, or service history. You can also track memberships or subscriptions rather than physical items. Record the type of membership, the expiry/renewal date and a host of other information.